Willis Machinery and Tools offers two different models of CNC bed mill with conventional mill heads: the BTM-40 and BTM 50. Providing customers with different sizes and capabilities, the BTM-40 allows for 40 inches of x-axis travel where the BTM-50 is able to provide 50 inches of x-axis travel. Willis CNC bed mills offer high quality, heavily ribbed castings. These large bed mills are provided with hardened and ground box ways as well as hardened and ground table surfaces for accurate machining. In addition to an oversize, high precision ball-screw, Willis CNC bed mills include programmable spindle speeds plus automatic lubrication and flood coolant systems. 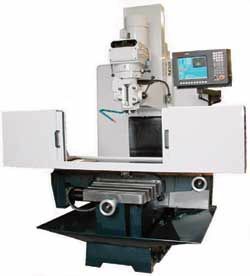 If a more rigid head is required for specific applications, Willis Machinery offers the RTM series, a large CNC bed mill with a machining center style head.